I had grand plans this week. Lots of blog posts in my head. Unfortunately exactly zero of those posts came to fruition! Life got overtaken by hospital visits once again. My three month routine bronch went a little awry and I ended up staying in hospital rather than coming straight home. Now I'm back at home recovering, with all weekend plans cancelled (including bike riding), and trying to catch up. What I really wanted to do this week was to finally show the finished quilt that B-Fab and I made for Cathie's upcoming arrival. 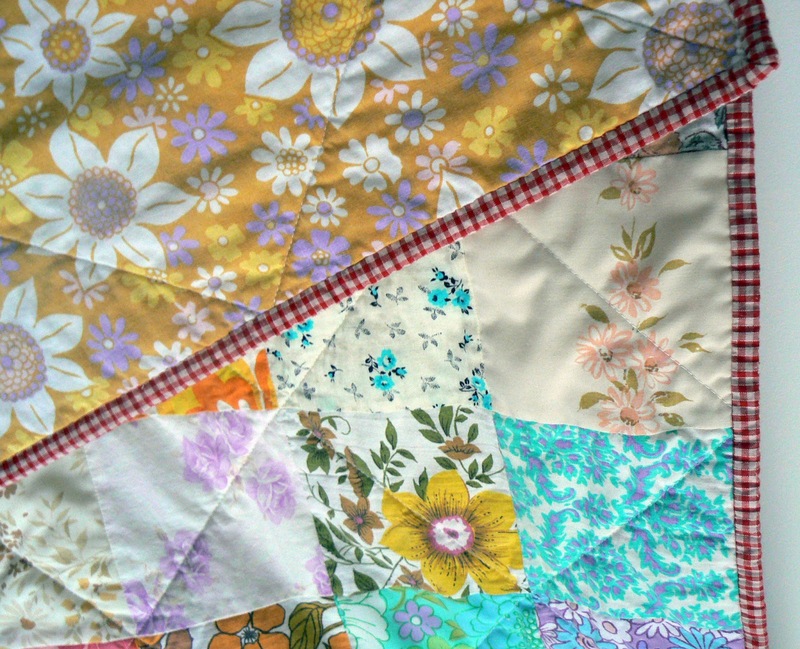 All those vintage sheet squares were so soft and snuggly. I hope the new bubba loves it! This photo is just to show my new appreciation of hand stitched binding. I was ooohinh and aaahing at it once I'd finished. I have another girlfriend who just had a new bubba so I might even try my hand at making a baby quilt all by myself.... but I have a couple of other projects that I need to finish first, so I really should get off the computer and get cracking! Sorry to hear you've had a set back Cam, but pleased to hear that you're home again recovering. 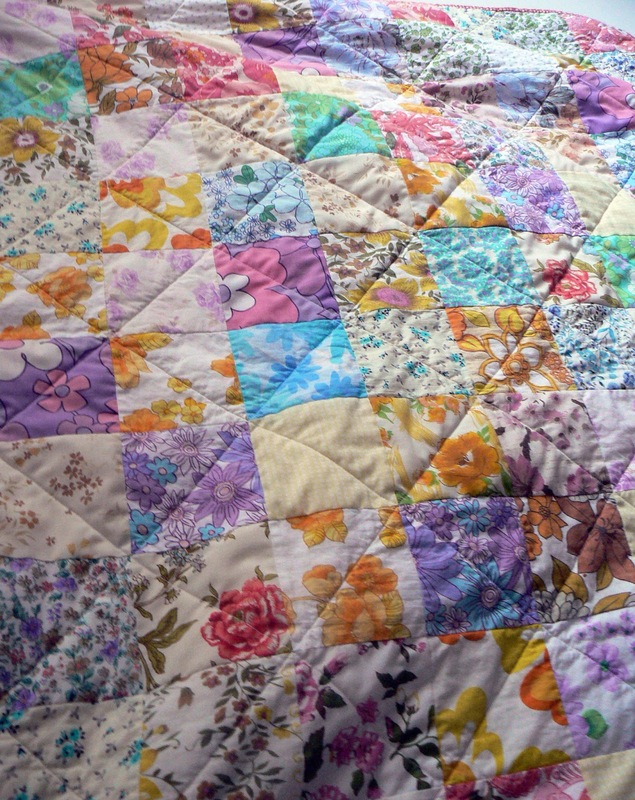 A snuggly quilt will sure be needed with the cold weather upon us and this one is very pretty. Sorry to hear about your bronch test. Good to hear you're home again. The quilt is beautiful and I am sure it will be very appreciated. Sorry to hear about your hospital stay. Hope you're enjoying being back at home and feeling better. 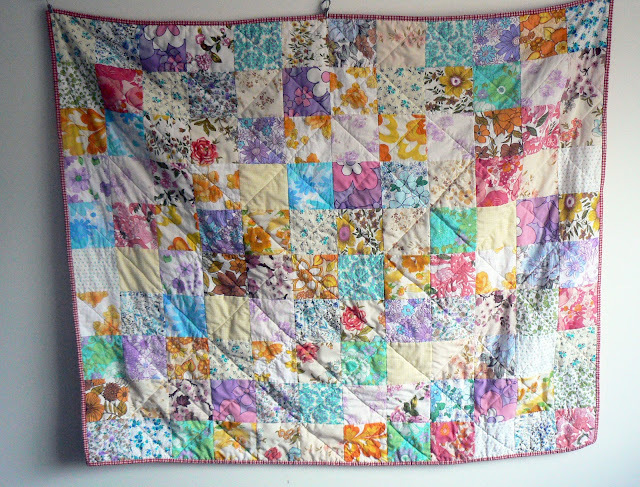 The new baby will love that quilt - it's very pretty and I have lots of admiration for all that hand-stiched binding! so glad you are home Cam and you are on the mend.